Don (Spokane, United States) on 16 June 2011 in Landscape & Rural. 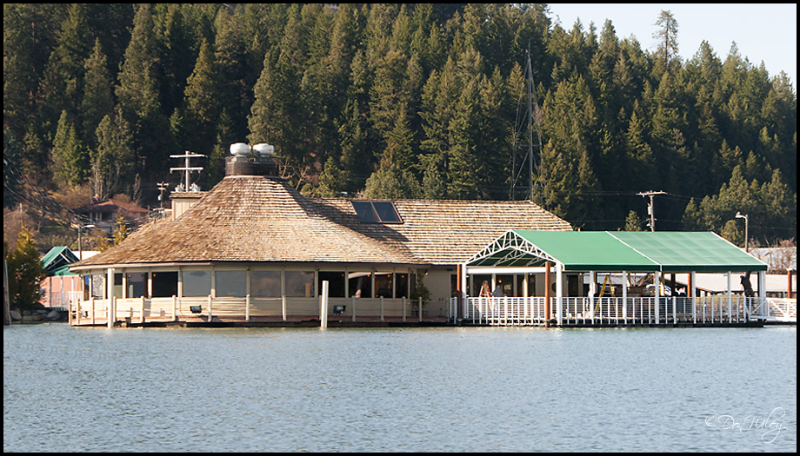 The Cedars Floating Restaurant on Lake Coeur d' Alene a well-knwon place to dine on the lake. It features fresh fish available daily and Midwest Stockyards High-Choice Beef. "The Cedars, founded in 1965, floats at the confluence of Lake Coeur d'Alene and the Spokane River and is renown for providing quality food and service. Buoyed by 600,000 pounds of concrete encased styrofoam,The Cedars is the perfect setting to take in breathtaking views of Lake Coeur d'Alene and Northwest delicacies such as Cedar Plank Salmon and a Biergarten Filet." The place looks like its about to go underwater....Nice! Chris is right . . and it is vital not to get Syrofoam mixed up with Styrofoam, too. One of them is highly explosive and I cannot remember which ! Could be a night to remember. Beautiful sight, well captured ! Beautiful scenery...love the pine trees! Really interesting -- concrete covered foam. Makes me nervous, like the concrete sailboats do. Psycological I know. This looks like a wonderful place to dine. I have visited the area and found it just exquisite -- less rugged and more accomodating than Montana. brings back lots of memories. we lived in Cd'A through most of the 70s. Not only does it look good, but it sounds good. A nice idea for fresh fish dining! A place certainly very pleasant to have lunch at the water's edge when the good weather is there. If I ever get there, this is one of the must-visit spots, for sure. hmm, a floating restaurant. I don't think I've ever eaten at one. nice capture of this place. Nice looking place, and the menu sounds delicious. I envy your water-top point of view, assuming you were enjoyinf a boat ride. What a great place. I have never eaten at a floating restaurant. That looks like a round room on the end! I would love to just go there and sit and have an iced tea...looks so relaxing. That looks like a great spot to sit and watch the world float by. Yes, right on the water. Looks and sounds like a great place. for a place with such history, i bet they serve great grub.. :) nice capture too..